Besides the major dartboard manufactures there are but a few pioneers in the world of darts. Dart players are always looking for something new that may improve their game; however Australian Russ Strobel has turned his attention to wheelchair users. In 2010 Russ submitted to the Darts Australia a new recommended dartboard height for Wheelchair users. The height Russ has come up with is 137cm to the centre Bull. The height was based on the perceived origins of the standard hanging height of the standard clock dartboard. It is said the average height of a man in the England UK was 5’8” around 1920’s, the height to the centre bullseye of a standard board. Modern adjustments make that 173cm. Russ has taken this analogy and worked out what the height would be should a man of 5’8” (173cm) be sitting in a wheelchair. 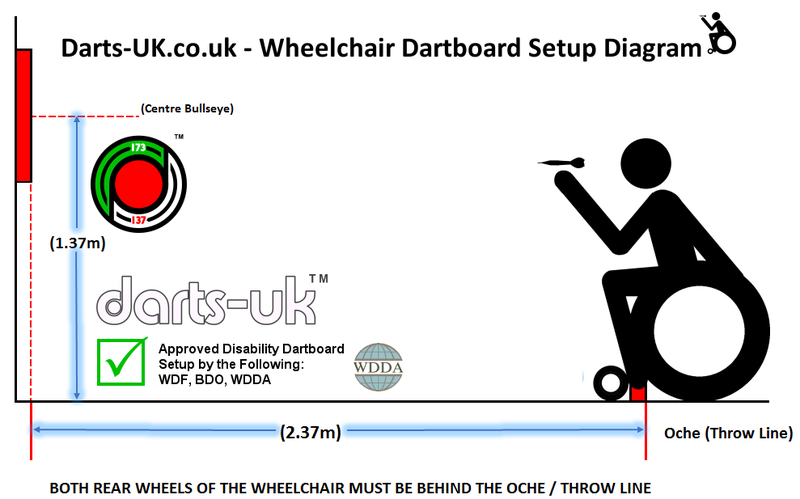 His exact figure came out to be 136.5cm however as Russ explains the addition of 0.5cm would make the recommended wheelchair dartboard height easy to remember 137cm (wheelchair) - 173cm (Standard). I agree with you Russ we all like things easy to recall. The aim Russ has in mind is for wheelchair users to be able to compete alongside an able body player so Russ has come up with a unique dartboard stand that rotates. A dartboard is mounted on both sides of the rotating panel allowing for quick and easy adjustment between players throws. On one side a dartboard is hung at the conventional height of 173cm and on the other 137cm. This pioneering approach certainly gets Darts501.com’s seal of approval and it also seems dartboard and darts manufacture Puma has recognised the Australian Darts ruling and is now providing the new wheelchair dartboard setup instructions on it’s website. 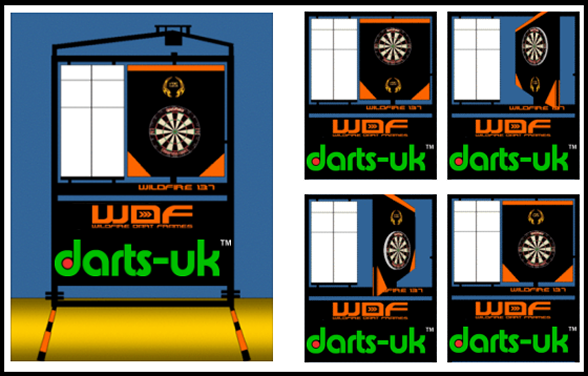 In October 2012 Russ met with the World Darts Federation in Hull (England, UK) regarding approval of the revised dartboard height for wheelchair users. He was delighted to report that after several years of campaigning the lowered board height has been approved by the WDF and will consequently open the sport of darts to players with disability in the now 70 member countries affiliated with the WDF. Darts has always been the sport you can play across gender and age difference also hasn’t posed a problem nor should disability. To set up a board at a different height should not cause tournament sponsors an issue and I personally believe this can only be good for the sport. Above is Russ Strobel’s Wildfire 137 Dart Frame. The only additional ruling to wheelchair darts is that both rear wheels of the chair must be behind the oche throwing line. The chair can be horizontal to the board as some players may prefer this. Players who wish to compete in these events need to contact Sarah Smale for an application / registration form. If you are new to disability darts then you will be assessed as to your disability category. Please not these events for part of the qualification to the WDDA Winmau World Masters Championship. Only players with the necessary qualifying ranking points are invited to play in the Winmau World Masters. The WDDA stage other disability tournaments across the World, however I haven’t been able to obtain a definitive list to publish. If you live outside the UK, I suggest contacting the WDDA for advice and more information. 22-24th February 2019 The WDDA World Cup Darts 2019, sponsored by Winmau. The first event of its kind will feature a number of Countries entering to compete in a World Cup Event. Venue: Vayamundo Oostendo, Zeedijk 290-330, 8400 Oostende, Belgium. 24th Singles Event (separate wheelchair and standing players). Open to all handicap players, not only team players. Details below show the ‘Impairment Classification and Eligibility for WDDA UK Tournaments’. Impairment classification for darts events is still in its early stages, but some things remain constant regardless of sport when considering the criteria set out by International Paralympic Guidelines. As darts has not yet been included amongst the sports held the Classification detail below is likely to change. The currency of this information is June 2015. I will update the detail as and when I am informed. Impairment classification for darts events is still in its early stages, but some things remain constant regardless of sport when considering the criteria set out by International Paralympic Guidelines. As darts has not yet been included amongst the sports held we can only ask their assistance to guide us along a parallel pathway of classification that would not require too many adjustments at the time darts is included. Classification provides a structure for competition. Athletes competing in Paralympic sports have an impairment that leads to a competitive disadvantage in sport. Consequently, a system has to be put in place to minimize the impact of impairments on sport performance and to ensure the success of an athlete is determined by skill, fitness, power, endurance, tactical ability and mental focus. This system is called classification. Classification is sport-specific because an impairment affects the ability to perform in different sports to a different extent. As a consequence, an athlete may meet the criteria in one sport, but may not meet the criteria in another sport. Each sport’s governing body uses the IPC's Eligible Impairment Types and applies them to their sport. •	that the severity of the impairment does not significantly impact on the activities required in that particular sport. Total or partial absence of bones or joints of the arms, legs of pelvic region as a result of trauma or illness or congenital limb deficiency (e.g. dysmelia). Classes are generally assigned to the athlete according to the number of limbs affected and the location in relation to major joints, (e.g. below elbow). Minimal Disability Generally, the amputation must be at least through the ankle or wrist. Spinal cord damage as result of injury or a congenital condition such as spina bifida, polio, transverse myelitis, sacral agenesis, spinal tumours, nerve damage, Erbs Palsy, Muscular dystrophies or other conditions that causes loss of muscle strength or paralysis in the trunk and legs (paraplegia) or legs, trunk and arms (quadriplegia) Classes are generally assigned based on where the injury has occurred in the spine and how this affects body movement. Minimal Disability (Australian Paralympic Committee) Generally, the muscle weakness in the legs, trunk, and / or arms, is tested using a 5 point scale. Athletes generally must lose at least 15 - 20 points to be eligible for a Paralympic Sport. This group encompasses those who have cerebral palsy or an acquired brain injury, stroke, brain tumour, multiple sclerosis, Cerebellar ataxia, hereditary spastic paraparesis or condition in which muscle tone, balance or movement co-ordination are affected. This includes conditions such as hypertonia (quadriplegia, diplegia, and hemiplegia), dystonia, athetosis and ataxia. Classes are sport specific and are assigned according to the impact on movement, balance and co-ordination and which areas of the body are affected most significantly. Minimal Disability (Australian Paralympic Committee) Generally the impact must be measurable in at least one joint in the arm or leg. For a player to enter competition a demonstration of their ability to consistently hit the playing surface of the dart board is required. Ten (10) sets of three (3) darts will be thrown during the assessment. After each set, retrieval by the thrower will be made and commencement of throwing the next set of darts within 90 seconds. Any darts that do not meet the surface of the dart board must not land outside the area defined as the “backboard”. No more than three (3) darts hitting the backboard in the assessment is permissible. Darts that fall short of the board will be classed as falling outside the defined “backboard” area unless they hit the dartboard or backboard before dropping to the floor. To attain the required LOSP in Accuracy no more than 3 darts may miss the playing surface of the dart board. All darts that miss the dart board must hit the area defined as the backboard and not outside this area. Retrieval of darts can cause fatigue and inaccuracy of throw as games progress. It is therefore important to assess the capabilities of the thrower to retrieve their own darts for the length of a match. WDDA hosted events will allow the use of a retriever of darts where required but this may not be the case in mainstream darts events where a player is expected to retrieve their own darts at all times. Retrieval assessment is carried out in conjunction with the LOSP for Accuracy. Using the time frame and number of darts thrown, determination will be made as to the need for an appointed “darts retriever”. Where poor accuracy appears to be caused by fatigue the thrower may opt for reassessment after a reasonable period of recovery using a dart retriever. If assessed as attaining the required LOSP in Accuracy with the assistance of a dart retriever the thrower will be required to use a dart retriever for the duration of the event - for all games played. Re-assessment must be undertaken prior to future events before any change to the conditions of play for that play-er can be made. The type of disability The level of care in attendance at the event The degree of aggression associated with any lack of etiquette. Where any lack of etiquette is likely, and a commitment by the carer is not forthcoming to be in close attendance at all times, the WDDA cannot accept that player’s entry into an event and therefore are considered to have failed the LOSP assessment regardless of the result in Accuracy and Retrieval. Attainment of LOSP in all three (3) Categories is required to enter a WDDA darts event. Attaining an LOSP in Etiquette is required for entry into WDDA Satellite events. Safety during assessment will not be compromised in any way or at any time. Where Accuracy assessments are taking place no person (including the Assessor) will be in front of the thrower. Nobody other than the Assessor may within 4 meters of the assessment area. The appropriate WDDA Assessment Sheet will be completed and signed by the Assessor and person being assessed upon completion and submitted to WDDA Officials prior to the event. The process of LOSP is a crucial to the safety, smooth running and integrity of WDDA events. WDDA LOSP Assessment results may be made available to other darts organisations where requested at the discretion of WDDA Board of Administrators. World contact World Disability Darts Association. The first World Disability World Cup was played 22-24th February 2019. 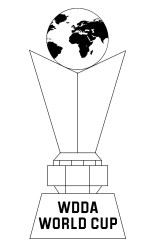 Teams from several countries took part including England, Wales, Netherlands, Belgium, Ireland, Germany, Russia, South Africa, Denmark plus tow additional groups team Europe and the Rest of the World. England, Germany and Belgium submitted two teams each to compete in the first WDDA World team cup. Earlier phase is a group round-robin. Four groups of three teams and one of four compete against each other with the two teams progressing to the quarter-final knock-outs. The quarter-finals through to the finals is a best of 17 legs. The event also includes two singles categories: Wheelchair and Standing.